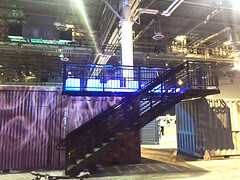 VDA Productions wanted to create an innovative and thoughtful entryway into the world’s largest marketing expo. The project was large-scale and needed to be completed quickly and within budget. It also needed to accommodate interactive portions of the display. In order to maximize VDA’s budget, we provided several existing assets to serve as the foundation for most of the build. 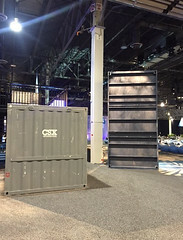 The rest of the structure was completed with custom-fabricated containers, including one that was structurally reinforced for vertical placement. 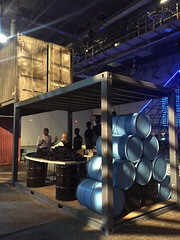 VDA wanted the look and feel of used containers to juxtapose the message of the expo, which was bringing information to a modern standard. So, for the purpose-built structures, we approached the process backward. Instead of polishing old containers to make them look new again, we took new containers and made them look worn and distressed. Behind the structure was a large lighted pyramid – a modern representation of the old-to-new theme of the show. 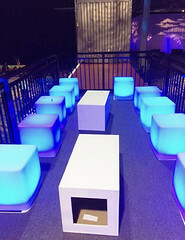 As part of the entry experience, attendees were encouraged to get on a stationary bike and pedal in order to light up the pyramid. As a takeaway, they received a t-shirt. 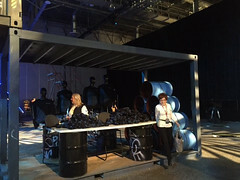 The activation also included a VIP lounge on top of the structure, complete with illuminated stools for clients to sit on. 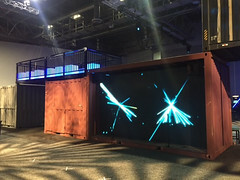 And the vertical container served as a video screen where people could interact with an avatar-like version of themselves. Boxman’s collaboration with VDA was complimentary from start to finish. The project went through several conceptual design phases before ultimately representing VDA’s vision. 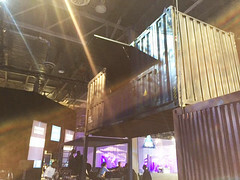 Both VDA and Boxman Studios were committed to maintaining the viability and purpose of these containers. 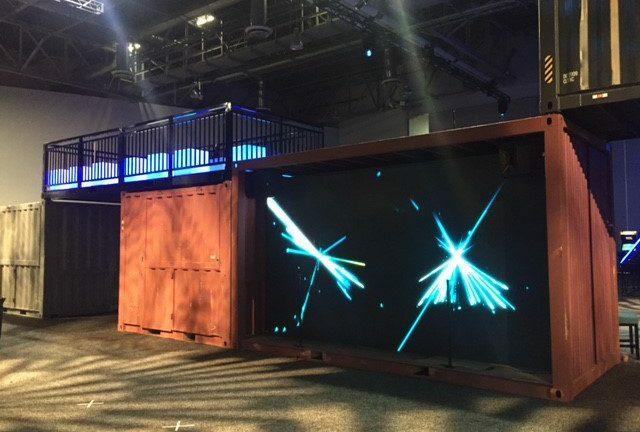 VDA Productions brings visions and brands to life for Corporate Meetings, Tradeshows, Themed Events, Exhibits, Themed Retail Environments, and Corporate Facilities. 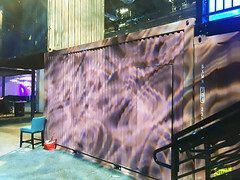 The company has produced events on a national and global scale and employs a full-time team of experienced professionals including executive staff, creative designers, account executives, producers and production managers, carpenters, welders, sculptors, painters, lighting directors and audio engineers. VDA provides clientele with virtually turnkey event management solutions integrating all logistical, production, fulfillment and management aspects, with the majority of production needs being met fully in-house.